Vilnius is holding the so-called Free Russia forum, the sixth one in a row. It's a sorry event, but I must admit, the name is striking. In general, the word "freedom" is invariably attractive just like the word "Russia". So when you put the two words together, "Free Russia" might blow someone's mind. The forum just needs to look the part. Yelena Yerofeyeva with the details from Vilnius. The hosts announced 500 guests but rented a hall that fits only 300. In reality, there were much fewer guests. They were expecting foreign experts from Britain, for instance, but some of them refused to go to Vilnius. The international forum ended up looking more like a hobby club. Even the Western media remained indifferent to the event. Neither journalists nor Lithuanians were too hyped up about the forum. The play was staged by the Lithuanian Foreign Ministry and partially financed by the US National Democracy Fund. The guests come from Ukraine, the US, Germany, Lithuania; there's also a small group of Russians and former Russians. Garry Kasparov: "The discussion we're holding here that some might consider too emotional and others might consider too radical is eagerly awaited by our friends and foes alike. I think we won't disappoint them this time". For two days, they were telling each other why they don't like Russia scribbling down yet another sanctions list. Snitching to Washington is their new work strategy. Two weeks ago, the former attorney Mark Feygin, who was disbarred earlier this year, flew to the US to submit his report. Mark Feygin: "This work is of interest to our friends in the West and in Washington, but not limited to the United States. However, Europe has been less successful at executing such operations". Perhaps some of Feygin's transatlantic friends suggested to him that it might the right time to expel Russia from Interpol. Almost two hours were dedicated to the matter. Mark Feygin: "What do you think, Natalia would it be right to expel Russia from the Interpol within the framework of sanctions like it was once suggested by McFaul? Yes or no?" Natalia Kantovich: "Interpol must at least suspend its membership and access to the databases. Moreover, I suggest that our forum should address Interpol with a petition". They're against Russia being in Interpol and against Interpol in general because the organization searches for criminals all over the world and not everyone in this room is as clean as a whistle. Former State Duma member Ilya Ponomaryov was persecuted by Interpol. He was charged with the embezzlement of the Skolkovo Million Fund. He fled from Russia to Ukraine and seems pretty happy with his new home despite the threat of a schism that was completely ignored at the forum. Ilya Ponomaryov: "I don't see the Church as being prosecuted. I see that the government is actively supporting the creation of the new Ukrainian Orthodox Church. They might be doing it a bit hastily because Mr. Poroshenko is not sure whether he's going to get another term or not". The Ukrainians were talking about Russian aggression but there was nobody more aggressive at the forum than the citizens of Ukraine. Arkady Babchenko and Aider Muzhdabayev who got infected with Russophobia exchanged their red Russian passports for blue Ukrainian ones not so long ago but already consider their former motherland to be a threat. Aider Muzhdabayev: "Russia is the ultimate evil, primarily for its neighbors". Arkady Babchenko: "They have a lot of dough. They have got resources. They have a strong army. And they have 140 million people who are crazy to varying degrees. The main thing we must understand that Russia is a dangerous neighbor". This time, Babchenko, the master of poorly-executed plays, didn't surprise anybody the way he did when he played his own corpse. He was allegedly assassinated only to resurrect a couple of days later. His body lying in a pool of pig blood was an artistic provocation staged to blame Russia for killing dissidents. Back then, the whole world was laughing at the SBU and at Babchenko himself. But despite all of the provocations, Germany maintains a positive attitude towards Russia and Putin says Boris Reitschuster. Boris Reitschuster, journalist (Germany): "Germany's trying to ignore all this insisting that the only thing Putin wants is peace and that he's just a victim of anti-Russian campaigns. And it's surprising how deep this Moscow agenda is rooted in the minds of the German people". Muzhdabayev parried his statement. In order to banish those pro-Russian sentiments, they must shut up journalists. The guests decided to write another tip note to Europe and the US on how to impose sanctions on the Russian media. Aider Muzhdabayev: "The influence of the Russian propaganda must be restricted, that's first. They must be thrown in prison because otherwise, they won't get it. They must be deported the hell out of our countries back to their beloved motherland the Russian Reich. We must lock our doors and take up arms. And we must be ready to shoot if necessary”. While the Merchants' Club was scolding the Russian authorities Giedrius Grabauskas came to the Lithuanian Foreign Ministry to submit a petition against the forum. Giedrius Grabauskas, leader of the Socialist People's Front: "Protected by the Foreign Ministry and some influential conservatives they're holding a sabbath that humiliates our country. We don't need to act in such a provocative manner." The paper was filed and ignored by the Ministry In the meantime, the opposition continued to party. In the evening, to relieve stress after the intense discussion the guests headed to a vernissage. Such a thing has never happened before at the Free Russia forum. Gallery-owner Marat Gelman, who fled from Russia to Montenegro, brought several collections to the exhibition in Vilnius, which is of course anti-Russian. This travel bag installation called "Time to Shove Off" was already exhibited in September by Gelman in Budva, Montenegro. In general, there were few pieces and a lot of talking about politics. - Stand here, in the middle, so we can clink our glasses. 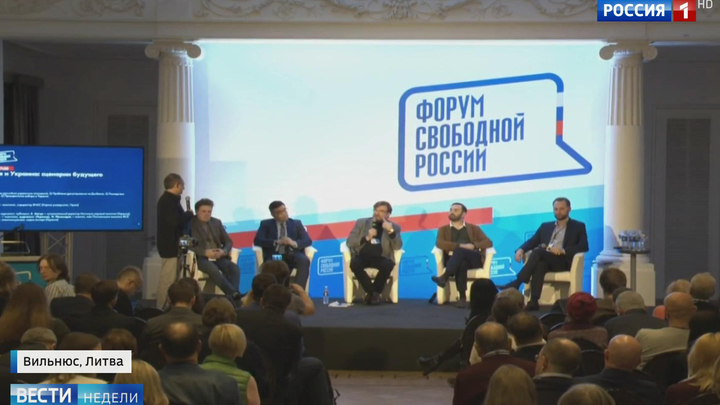 The Free Russia forum was ended with a rock concert performed by Vasily Shumov. It still wasn't clear what the point of all of that was: to share the accumulated home-sickness or earn the money paid by their employer? Soon, they'll head to Washington with a progress report. Yelena Yerofeyeva, Kirill Puzyrny, and Viktor Barmin Vesti: News of the Week, Vilnius.